Those who think life starts to wind down after a certain age should take a leaf out of Chau Smith’s book of life. At the age of 70, she is still taking on challenges at full speed, proving you are never too old (or young!) to do something badass. So far she has run more than 70 marathons in her lifetime, but it is one feat in particular that makes her achievements all the more inspiring. This Missouri-based marathon runner has completed 7 marathons in 7 days, across 7 different continents, between January 25-31. The races took place in Perth, Australia; Singapore; Cairo, Egypt; Amsterdam; Garden City, New York, Punta Arenas, Chile, and King George Island, Antarctica. 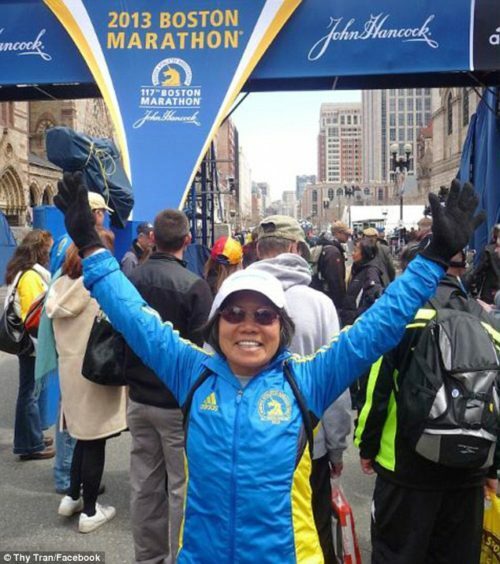 According to CNN, Chau would run the full 26.2 miles in each race, then get on a place to her next destination. Chau’s endeavor was made possible through a company called Marathon Adventures which organized the trip for her and 9 other participants. This particular challenge has a special name: the Triple 7 Quest, which is not for the faint of heart. Chau says it took her 8 months training preparation, where she was running up to 130 miles a week in the final four months. 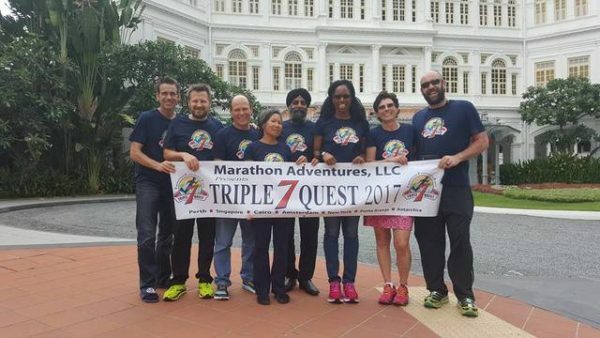 She chose not to publicize her ambition before taking on the Triple 7 Quest, said Steve Hibbs, owner of Marathon Adventures who organized the trip. “She overcame a lot, and it was just really impressive to see her run and complete the event,” he said. It’s not just the race alone that can be a grueling feat for any participant. The locations of some of the races came with their own set of challenges. The temperature during the Australian race was above 100 degrees Fahrenheit, and left Chau severely sun burned. The group almost didn’t make the 7 day completion deadline as the flight from Singapore to Egypt was delayed in Abu Dhabi. Once they arrived in Cairo, they only had minutes to change and refresh before starting the race. Talk about hitting the ground running! It was suggested to Chau to try to half-marathon in Cairo instead, given the time limitation and needing to finish the full marathon in 6 hours, instead of 7. Chau chose to do the full marathon, and ended up finishing it in 5 hours and 51 minutes, proving yet again that she is not the type of person to be underestimated, even under pressure. “All my life … I always did crazy things. When I was young in Vietnam, I was a stubborn kid. My family always never knew what I was going to do. I always showed them I can do it, just like boys,” she said. Chau told the Huffington Post that her legal age states she is 67, but her real age is 70. “After her father was killed in the French occupation of Vietnam during the First Indochina War, her mother went into hiding while pregnant with Smith for their safety. After she was born in 1947, her mother didn’t report it for three years. That’s why she wanted to honor turning her real age ― 70 ― this year in a special way,” writes Lindsay Holmes. 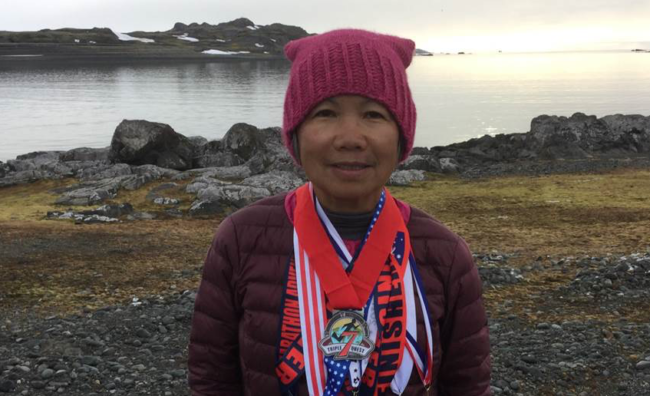 “As I approached my 70th birthday, I wondered what I could finish from my bucket list, so I decided to do the Triple 7 Quest,” Chau told HuffPost. Today, Chau runs a dry-cleaning business by day in the city of Independence, MO, but it is her athletic passion that keeps her going. 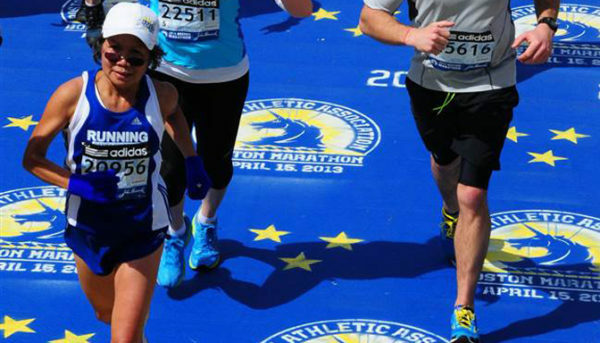 The marathon runner participated in the Boston Marathon in 2013, but was unable to finish due to the bombing. Since then, she has completed it twice. Chau’s husband runs marathons with her, but he and her two daughters do worry about her health at times. “When I told my husband, he said, ‘Well, I support you, and I’m always behind you, but the only thing I worry, you get hurt,'” she said. But Chau isn’t done with marathons just yet. She is planning to participate in the Triple 8 Quest, which Marathon Adventures is organizing. That event would include Zealandia, a microcontinent, and take place later this year. She does plan to retire at some stage, and during that period she plans to hike the Appalachian Trail. The thrill of running keeps her healthy and happy, something that is backed up by studies on how exercise can help keep the brain sharp, increase longevity and decrease anxiety. Chau’s efforts are a great reminder that each of us are more powerful and capable of doing great things than perhaps we give ourselves credit for. It’s not about trying to measure up to someone else’s idea of success or happiness, it’s about our own personal best. “It was never my intention to become a long distance runner, but the more I ran, the better I felt … no matter how stressful my life has been or is running is the best therapy I’ve ever had. So, I’m hooked on running because I can clear my head and make better decisions,” she told Huffpost. Hear Chau talk about the Triple 7 Quest in the video below, and why she loves marathon running so much.